All teeth are an important part of one’s chewing, speaking, and most importantly keeping the other the teeth aligned properly. When tooth loss occurs, the tooth or teeth must be replaced so that all of these functions can continue the way they should. Many times, a dental bridge is used to fill in the gap caused by the loss. What are the options for a dental bridge? Traditional bridges, or fixed bridges, are the most popular type of bridge. They are held in place by dental crowns and consist of one or more fake teeth. These dental crowns are also called abutments, which are permanently cemented onto the teeth adjacent to the missing tooth. They can only be removed by dental professionals. Removable bridges are another option for replacing a missing tooth. They are attached to the adjacent teeth with precision attachments or metal clasps, and can be removed easily for cleaning. Dental health is a very important part of one’s overall health. Bridges can help restore this dental health if tooth loss does occur, as well as assist in one’s oral appearance and functionality. This includes distributing the power of one’s bite properly and preventing the remaining teeth from drifting. When teeth are missing, harmful stresses can affect the gums and other oral tissues. This can potentially lead to other, more serious disorders, such as gum disease. At the first visit, the abutment teeth are carefully prepared. This involves removing a portion of enamel from the teeth to reform them so that a crown can fit over them. Impressions of the teeth are then made, which are sent to a dental lab where the bridge, crown, and fake tooth or teeth are formed according to the specific mold. 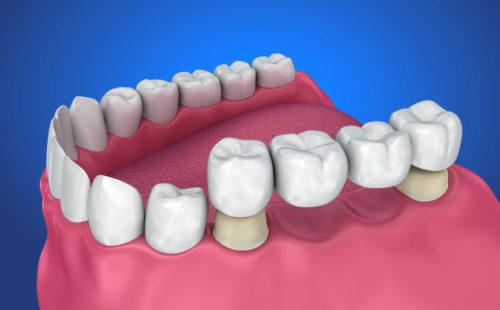 A temporary bridge is usually given to the patient to protect the exposed teeth until the permanent bridge is complete. During the second visit, the temporary bridge will be removed. The new metal or porcelain bridge will then be inserted and adjusted as needed to achieve a perfect fit. Sometimes, more visits are necessary to ensure the fit of the framework and bite. If it is a fixed bridge, it may be temporarily cemented at first to make sure it is fitting properly. Once this has been ensured, it is then permanently cemented into place. Dental bridges are usually made one of three ways: all porcelain; porcelain fused to metal; and all metal bridges. How are bridges kept clean? Brushing and flossing bridges and the surrounding teeth is very important, as the bridge strongly relies on the adjacent teeth for support.